It’s a truism that there is no bad weather, only inappropriate clothing. We stock clothing that supports riding in town every day year round. Including gloves: a few kinds, none of them sporty. But if you ask me which is best, I’ll give you my opinion. Go ahead. 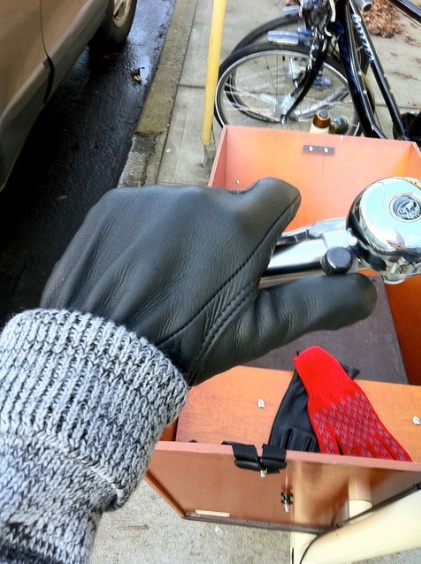 OK, here’s the deal: there is no one best glove for cold weather riding here in rainy Portland. But there is a best system, same as for any other part of your body: layers. 80% of the time, all you need from November to April are mid-weight wool gloves. Not too hot, but insulating even when a bit wet. You can even wring them out if soaked to restore some warmth. They will usually dry overnight if left in a warm spot, say over a stove or heating register. Currently we stock Ibex brand lambswool-nylon ones in black and “hand signal” red, with rubberized dots on the fingers and palms. These are much softer and lighter, and dry faster, than common rag wool types, yet seem to wear just as well. For the other 20% of the time, whether it’s bitter cold or pouring, you need windproof, water-resistant shells over the wool. Not insulated! Just shells. What’s wrong with insulated gloves? Apart from the fact that they will be too warm 80% of the time, on a bike in the rain, the insulation will get wet sooner or later, whether from the rain directly working its way in, or if truly waterproof, then from your own perspiration. (It happens even if you’re not “sweating.”) The latter is worse from an odor/gross-out factor POV. 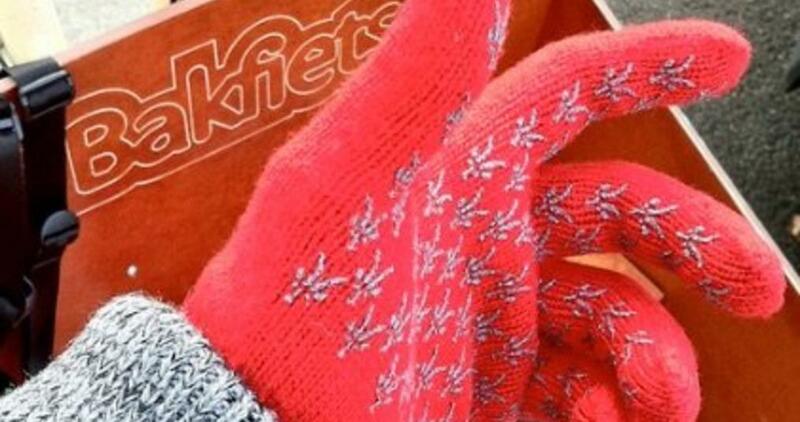 Either way, it takes much longer for any all-in-one super warm glove to dry than a separate shell/liner system. Swampy or gym-sock odors will take hold. Unless you want to run a dryer every night, you’ll need several pair of insulated gloves to match the convenience and comfort of a single quick-drying, two-part system. In my search for a replacement, I considered the nick that doomed the thin shell, as well as my preferences for natural materials and local manufacture. I bought unlined deerskin motorcycle gloves. That was two years ago, and there’s no looking back. Let’s face it: there’s a whole lot more investment at a societal level behind the idea of motorcycles as practical transportation than bicycles, and some of the functional requirements cold-weather clothing-wise are similar. The gear is evolved. Among motorcyclists, deerskin is considered the best glove material, as it remains buttery supple after repeated wettings, is slightly elastic to avoid binding, totally windproof, strong and exceptionally abrasion-resistant, and comes from a natural resource in superabundance since we drove wolves nearly to extinction in this country. Deerskin also will protect the skin of your hands better than a thin shell when your number comes up to suffer a “traumatic event” on your bike, say going down on wet leaves or steel street elements. We now stock Churchill unlined whitetail deerskin “biker” gloves, sewn in Centralia, Washington. They look and feel great! They’re water-resistant as is, but slather in Obenauf’s leather preservative to proof them, along with your Brooks and your boots, and you’re ready for anything. Get them “too big” to accommodate a wool liner, or regular size to use plain on warmer days. I did disclaim that this was my opinion? Other opinions here are that all-in-one gloves are fine because it’s easier to keep track of two gloves than four. Touché! But I counter that four are better than two because you can afford to lose 2 before you have none at all... Anyway we have all kinds of gloves.